Please contact the owner directly @ 757-945-0110 or tombaise75(at)gmail(dot)com.I am the original owner of this Clearwater Model 2300. This is a 24' long, wide beam boat set up with a single 2-stroke 300hp Yamaha. Pushes this boat at cruise 34mph. Hummingbird color chartplotter, 24nm Radar/Chartplotter, VHF, Lowrance DF/FF, AM/FM/CD player, Spreader Lights, Rocket Launchers on hard top with many other rod holders installed. Port a potti in cabin, cabin lighting, 2 livewell/baitwells and under seat tackle drawers. Under gunale rod storage also. Remote spotlight installed on hard top.Aluminum I-Beam dual axle bunk trailer. 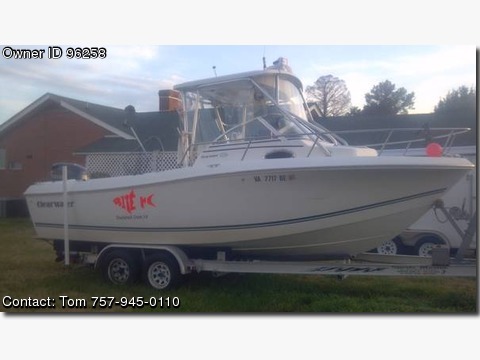 I fish this boat regularly and will be rockfishing/tuna fishing it until it sells. Simply asking what I owe the bank for this boat because I want to upsize to a larger boat. I am not interested in anyone selling this boat for me so do not reply, I am not broke so do not ask me to take less. This has been a great boat and will continue to be a great boat. The motor has been proffessionally maintaned and has never failed. Currently has 530 hours roughly but that will rise while I am fishing.